A 3* hotel, located in a modernist building that has been completely rehabilitated. It is located on a pedestrian street, it is very quiet and its rooms are modern in design, very bright, and offer all the comforts of a 3* hotel in the center of Barcelona. They occupy two modernist buildings totally rehabilitated and recently built. All of them have views of the Sagrada Familia. We have the Apartment or Suite that best fits your needs, from 40 m2. Up to 80 m2. With fully equipped kitchen and capacity up to 6 people. 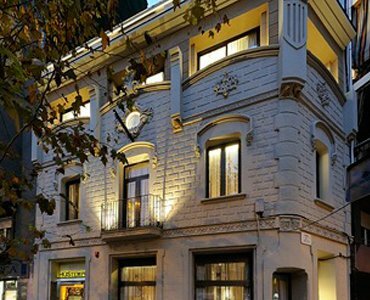 Hostemplo is a charming hostel, which occupies the entirety of a three-story building. All rooms have a private bathroom. 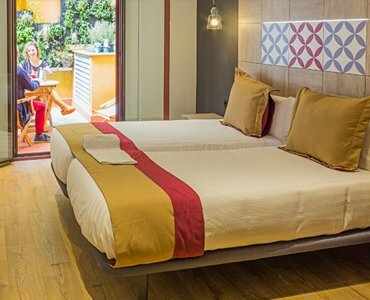 Enjoy the comforts and tranquility of a small hotel at a lower price. You have the option of breakfast available at Hotel Boutique Hostemplo, located opposite. A very short distance from the Sagrada Familia temple of Barcelona! 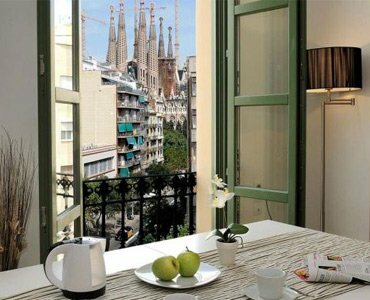 Hostemplo is a new accommodation concept in the center of Barcelona that offers three alternatives: Aparthotel Hostemplo Suites, studios, Hotel Boutique Hostemplo 3* and Hostemplo Hostel, all of them distributed in 5 buildings very close from each other (150 meters). The hotel is the geographical center. All of them have an extraordinary location in the center of Barcelona, close to the famous temple of Sagrada Familia, from the great architect Gaudí. Just by booking on our website, free breakfast during your entire stay. Breakfast is free for all guests of the room. Free cancellation of your reservation (up to 7 days before the arrival date). Except in non-refundable rate. You can book now and pay upon arrival. Except in non-refundable rate. With Hostemplo you will always have the best price guaranteed. Book on our website!